No matter how much you like this show, it’s clear that FiM‘s magic system isn’t particularly robust. 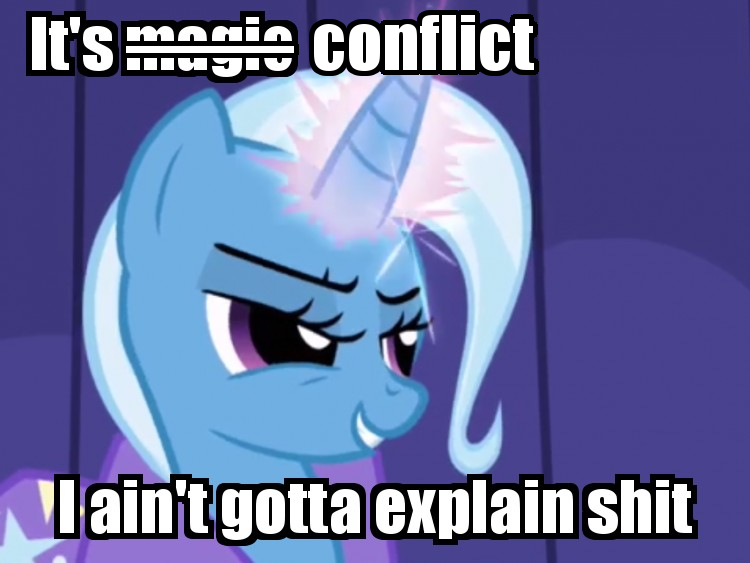 There aren’t many clear rules as to how magic works in Equestria. A completely unreal world can be constructed, in which asses fly and princesses are restored to life by a kiss; but that world, purely possible and unrealistic, must exist according to structures defined at the outset (we have to know whether it is a world where a princess can be restored to life only by the kiss of a prince, or also by that of a witch, and whether the princess’s kiss transforms only frogs into princes or also, for example, armadillos). As I’ve written before, without knowledge of the characters’ abilities, we can’t have dramatic tension. We won’t know the stakes, we won’t know the dangers, and we won’t understand the conflict — which means the story won’t be effective. …Or so the conventional wisdom goes. Yet FiM‘s lack of clarity doesn’t generally seem to hurt the series. I know I’ve complained at length about Twilight’s teleportation ability, and I stand by those statements — but that’s the exception that proves the rule. Those instances stick out because they’re uncommon. It’s actually pretty rare that an element of the world’s magic system (or lack thereof) hurts the narrative. Why? For an answer to that, let’s turn to a giant of fantasy worldbuilding: Brandon Sanderson. If you aren’t familiar with Sanderson — first of all, change that right now. Second of all; when Robert Jordan learned that he wouldn’t live long enough to complete The Wheel of Time, Sanderson was the guy he picked to finish it. That should be all the endorsement you need. An author’s ability to solve conflict with magic is DIRECTLY PROPORTIONAL to how well the reader understands said magic. (Emphasis his). When I first heard this law, I thought it was just another way of saying “more developed magic systems are better”. And if you interpret the law this way, then FiM‘s magic system (such as it is) is a bad one. An author’s ability to solve conflict with magic is directly proportional to how well the reader understands said magic. (Emphasis mine this time). You can create all the conflict you want without explaining anything. You can use poorly-explained magic to give your characters all kinds of headaches. It’s only when magic starts helping your characters that you ought to set some rules. 1) Magic causes problems far more often than it solves problems. 2) In those instances where magic does solve problems, that magic tends to be better-understood than usual. As an example, consider everyone’s favorite barrel of narrative conflict; Discord. Enter DISCORD. Pause for applause. Continue episode. 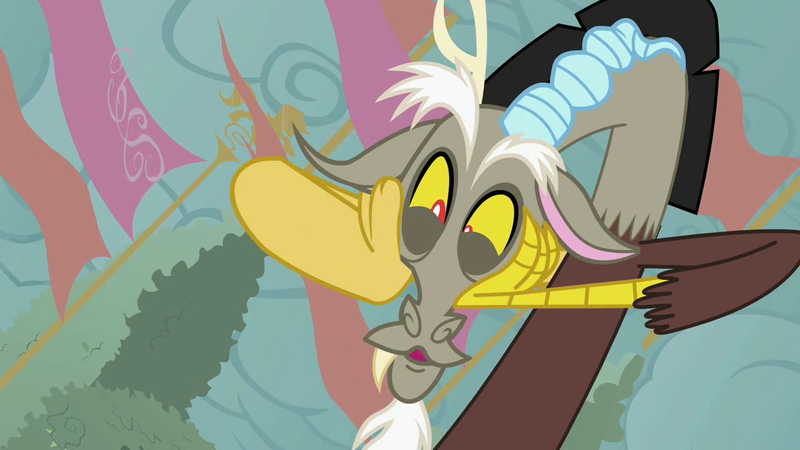 Discord’s magic is the least-understood of all the characters in FiM (which makes sense because, y’know — chaos-god). Correspondingly, in every single appearance he’s made, even post-reformation, his powers have been a source of conflict, rather than a solver of conflict. In order to use Discord to successfully resolve conflict, the writers would have to explain his magic, and establish some rules as to what he can and can’t do. Otherwise, he can effectively do anything, at which point we can kiss all conflict (and therefore all story) goodbye. But as long as Discord is causing conflict, his powers can remain opaque, and it still works. 1) The Elements can only work if all six elements and all six bearers are in the same place. 2) The Elements can’t work if the bearers have ceased to personify their elements. 3) The Elements can’t work if all the bearers aren’t willing to use them. The limits of any magic system are more interesting than the powers of any magic system. We see the limits of the Elements exploited in “Return of Harmony”, “A Canterlot Wedding”, “Keep Calm and Flutter On”, and “Princess Twilight Sparkle”. In all these episodes, the limits of the Elements create major conflicts and better stories. We tend to think of less-developed magic systems as a sign of worse writing. But really, that’s an oversimplification. Well-described magic systems are always nice, but they’re only necessary if they resolve a conflict. This entry was posted in Analysis, Storytelling technique, Worldbuilding and tagged Cartoons, Discord, My Little Pony, My Little Pony: Friendship is Magic, Storytelling, Worldbuilding, Writing. Bookmark the permalink.